Police forces were being established by the early 1840’s in New York, Boston, Chicago and other cities in America, and it is Allan Pinkerton who did most to promote the “French Method” of policing in the United States. Some argue that, by severing relations with England too early, the United States was not able to embrace the more “Enlightenment inspired” policing adopted in England in favor of maintaining a decentralized constabulary system (Pringle, pp. 11-12) and localized experiments. Allan Pinkerton was brought up in the tough, poor Gorbals District of Glasgow, Scotland. His labor activism, which made him a wanted man and sent him to America to become the country’s first spy master, belies his agency’s future reputation as a union buster. At 18 he worked his way out of severe poverty by apprenticing as a barrel maker. By age 20 he was an outspoken supporter of the Chartists, a group fighting to gain a free vote and better working conditions and labor unions. The group was militant and the common clashes with police caused them to eventually be outlawed. A reward on his head, young Pinkerton and his new bride, Joan, were smuggled aboard a ship headed to America. The ship foundered and sank off the coast of Newfoundland, and as survivors came ashore, they were robbed. Despite all this adversity, with the help of the New York Coopers Guild he was able to find work and make his way to Chicago, where he joined up with a welcoming friend, a fellow Chartist who had also fled (Sieple). By 1846 the Pinkertons lived in Dundee, Illinois and Allan had a small barrel making business. A staunch anti-slaver, his home was a safe house for the Underground Railroad, where they gave food, shelter and sometimes job training to help slaves escape. One day while scouting for timber to make barrels, Pinkerton’s life was transformed. He spied a group of men engaged in suspicious behavior on a remote island on the Fox River and took his suspicions to the local sheriff. They and a posse went to the island and staked it out and got the drop on a gang of coin forgers. Pinkerton was a local hero, and the sheriff asked him to stay on as deputy. He was a conscientious law man and before long, Chicago police had heard of him and in 1848 offered a job as a police officer. His two-fisted style was effective and in another two years he became Chicago’s first detective. He lasted only another two years in Chicago’s corrupt political climate, where too often he made the mistake of arresting people with friends in high places. So he quit and formed a private detective business whose iconic eye and motto, “We Never Sleep” reflected his determined Enlightenment attitude that security was a good thing for an ordered society and could be won with enough oversight. A reputation for honesty was earned by his adherence to a set of founding principles that demanded, among other things, trustworthiness and refusal to break the law to enforce it, as with refusing to pay informants to betray fellow criminals. His agency was unique in not letting its agents take rewards allowed to even sanctioned police detectives because it was a practice so easily compromised (Gunter, Hertig 8). A good business sense helped build his agency quickly. In the years running up to the Civil War, the railroads, sitting ducks for robbers, were his biggest clients. Local police had no jurisdiction across state lines, so he established offices in various states to allow him to work across borders. The Pinkerton MO was to go undercover to trace down wrongdoers. He developed the art of “shadowing”; following suspects without being seen. When he busted a railroad employee for stealing the unheard of sum of $40,000, undercover operatives able to get back most of the money stolen, the owner of the Philadelphia, Wilmington and Baltimore Railroad heard about it and contacted Pinkerton. He had gotten warnings of a possible plan that Southern sympathizers might try to shut down his railroad, a major Northern artery in to Maryland, a slave state, to limit Northern troop movements in case of war. He wanted Pinkerton’s help to find out the truth. Pinkerton and operatives went to investigate, including the first ever woman detective, Kate Warne (whom he later named to head his newly formed Female Detective Unit). In Baltimore they made entry in to the local secessionist movement and discovered a plot much larger than robbing trains. They had stumbled on a plot to assassinate the newly elected President, Abraham Lincoln. Lincoln’s plan was to take a train from Chicago to Washington, DC, for his inauguration, stopping at every whistle stop along the way to greet the crowds. In his final stop in Baltimore, something was planned to happen. 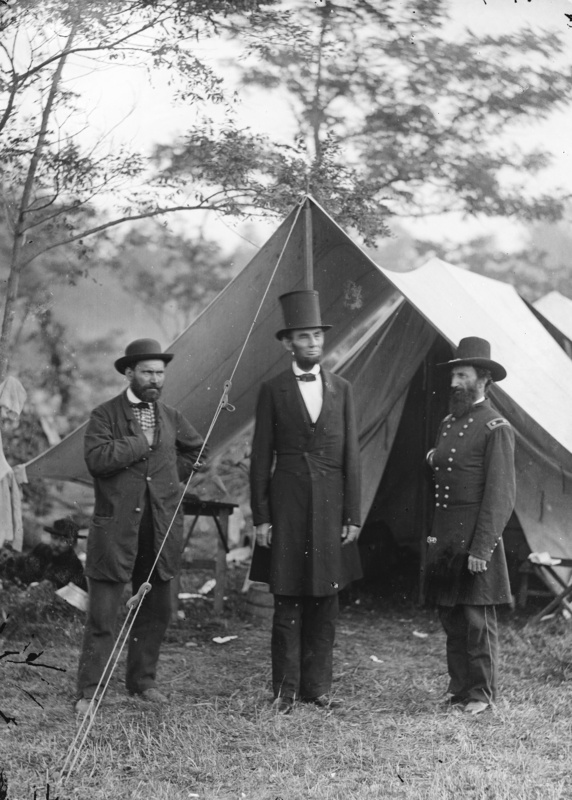 With three weeks before the inauguration, Lincoln and Pinkerton met. They knew each other from before, when Lincoln was a lawyer for Illinois Central Railroad and Pinkerton was its security, and Lincoln trusted Pinkerton. Pinkerton urged the President not to make the Baltimore stop. Lincoln reluctantly agreed. But he stayed determined to have a layover in Harrisburg to attend a flag raising ceremony commemorating Kansas statehood. Lincoln felt that the symbolism of marking the entry of a slave-free state, made that way after a bloody struggle, needed to be honored (Sieple). And so it was. Lincoln’s train whisked through Baltimore and Lincoln made his inauguration. Afterward, Pinkerton offered his ongoing services in a letter hand carried by operative, Timothy Webster. In getting the letter from Chicago to the President, Webster discovered a British traveling companion to be a southern sympathizer carrying intelligence and was able to covertly arrange for his arrest. Because of Webster’s success, the President invited the Pinkerton agency to maintain its spy network in the South on behalf of the Union. Pinkerton became spymaster for the Union Intelligence Service, which he referred to as the Secret Service. He had operatives in Maryland, Virginia, Georgia and other places, posing as British cotton buyers, slave traders, a British nobleman and his servant (also an operative) on vacation, and others. They kept track of troop numbers, movement and fortifications, weaponry, and other intelligence and transmitted in code via post. The “nobleman” (really a Welsh street urchin) is said to have had a number of informative (Pinkerton provided) Campaign drinking encounters with confederate officers. As the war progressed, several Pinkertons were arrested and one, Timothy Webster, who had carried the letter to Lincoln, was hanged. Pinkerton fired the agent who had fingered Webster in order to save his own life and those of two other operatives (Sieple). Pinkerton was accused of supplying weak intelligence that overestimated enemy troop strength in a key battle that Lincoln thought could have been decisive. The attack was held up based on the faulty intelligence, so there was no great victory. The Union General was relieved of his command and Pinkerton resigned in protest; the first Secret Service was disbanded. But the investigations business stayed steady. With the expanding railroad came expanding railroad robberies. The Pinks, as they came to be called, succeeded in covert operations that brought to justice some of the West’s most notorious outlaws, including the Reno Brothers, Cole Younger, William Cantrell, Frank and Jesse James, among others. Over the next 50 years, the Pinkerton Agency took on a mixed bag of romance for chasing down the likes of Butch Cassidy and the Sundance Kid, and others notorious outlaws, and hatred among union organizers for their infiltration of unions and breaking them up on behalf of big business. His operatives infiltrated and brought down the militant union group, the Molly Maguires, a violent Irish group fighting for improved working conditions for miners. Their tactics of murder and intimidation put them outside the moral code of the former militant union man (Toerey). After nine Pinkertons were killed in 1892 during the Pennsylvania Homestead Mining Strike, Pinkerton’s sons, Billy and Bob, who took over the business after Pinkerton suffered a stroke, refused to intercede anymore in union unrest (Sieple, Toerey). Pinkerton Agency established an international reputation when Billy was able to recover a very valuable painting stolen 26 years previously from an art gallery in England. The agency also helped Scotland Yard capture the Bidwell Brothers, who had stolen more than a million dollars from the Bank of England. But with the 1908 establishment of the US Attorney General’s Investigation Bureau, precursor to the FBI, Pinkerton was losing business. His was no longer the only agency of national scope local police could turn to for help. However, many of Pinkerton’s methods of disguise, undercover infiltration, detailed record keeping with MO, full description and mug shots were adopted wholesale by the new agency, as was the moral character and professionalism he had promoted in his agents. Pinkerton agency would reinvent itself as a security company specializing in security for banks, jewelers and racetracks. At racetracks they watched for pickpockets and established a horse identity process to guard against ringers (Sieple). In 1911, Scotland Yard invited Billy Pinkerton to come to England and witness how the new technology of fingerprinting could be used to solve crime, and Billy became a tireless promoter of the process upon his return. This is a historic turn in the story of surveillance. Fingerprinting, for the first time, made it possible to prove positively that a specific person was at a crime scene or used a murder weapon or other incriminating surface without actually being seen by a person. The era of backward looking surveillance was beginning to arrive.